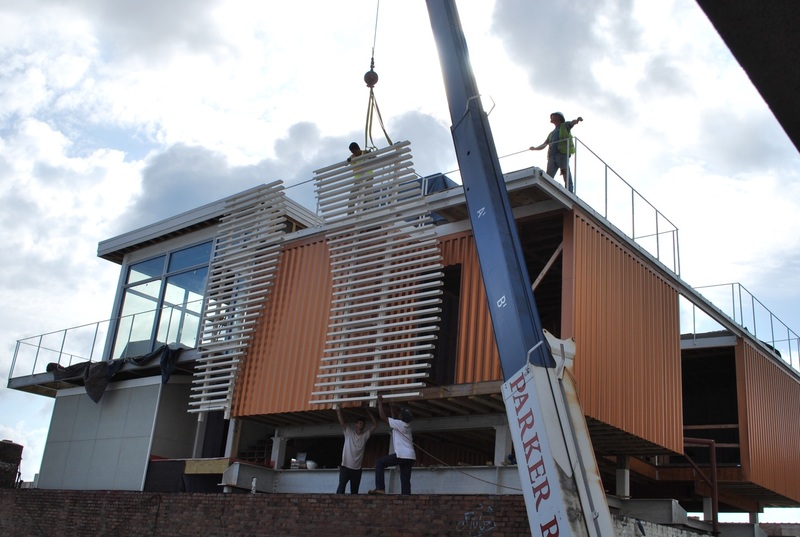 Cover photo: Installing some of the assembled FRP louvered panels on the rooftop residence. Renew Urban Charleston, LLC in Charleston, South Carolina has been using WEST SYSTEM® Six-10 Epoxy Adhesive to glue hundreds of pultruded fiberglass channels and square tubes together to form decorative louvers. When installed on the building, the louver assemblies create an aesthetic detail that draws attention to the unique rooftop residence on King Street in Charleston. The project architect, Kevan Hoertdoerfer, dreamed up the idea of a super contemporary steel and glass inspired building placed in an historic context. He and our client worked for several years to develop the design and engineering while seeking the right general contractor for this project. Renew Urban Charleston was selected based on our experience and understanding of what would soon become a very complex, strategic construction process. Renew Urban was founded in 2007 by Andy Meihaus and Mark Regalbuto. The core of our business is high quality “boutique style” historic restorations of commercial and residential spaces. Andy’s experience with high-end new construction made him the right contractor to oversee the job. Shortly after we signed on as the GC, the company responsible for the engineering designs closed due to the recession and we were forced to find a new engineer capable of understanding the complexities of this building. Luckily, Ed Fair with Rosen & Associates here in Charleston was a great fit for this job. Ed was actually the first person who recommended that we use a West System Inc./Gougeon Brothers’ product adhesive. The system itself is comprised of pultruded structural fiberglass operable louvers. It’s designed to balance on two track systems so that the homeowner can open and close them based on which balconies he wants to use at a given time. Each louver is made up of two 3″ vertical tubes with 90° angles and necessary bolts, nuts, and washers- all made of pultruded fiberglass. The final aesthetic detail is made of the pultruded fiberglass channels and all of these are held together with the Six-10 Adhesive. The fiberglass manufacturer also recommended that we use Six-10 Adhesive based on its impressive tensile strength capable of holding such a system together. 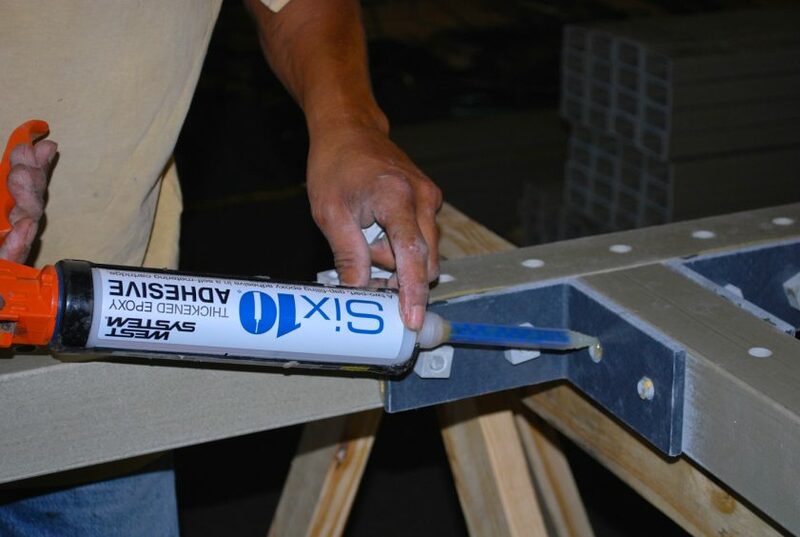 Before gluing 90° FRP angle brackets to 3” fiberglass pultruded tubing with Six-10 Adhesive, surfaces were cleaned with a solvent wipe and sanded dull with fresh 80-grit sandpaper. 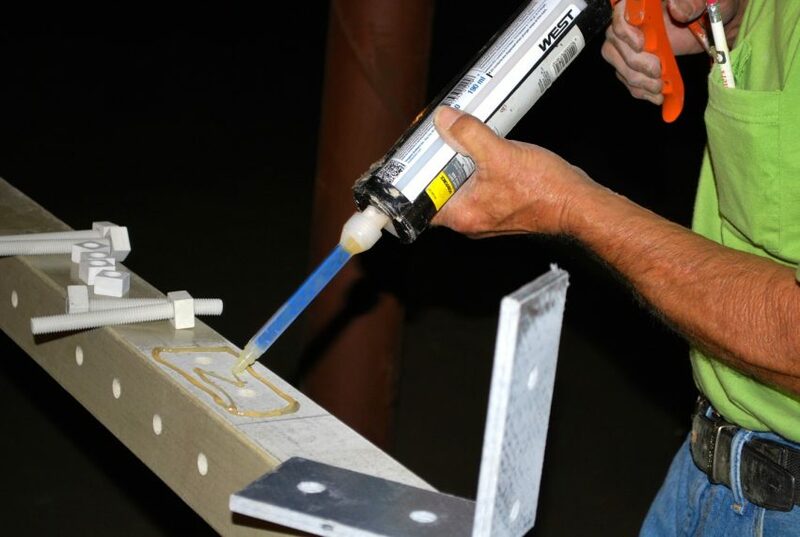 Because there are limits to how much FRP bolts can be tightened, Six-10 Adhesive was used to glue them in (at least for these angle brackets) so they would not loosen up over time. It is the first contemporary design of its time to be approved by the City of Charleston Board of Architectural Review. It’s also the first project in the City of Charleston to have been awarded the air rights to construct on an existing (and historic) building. This residence is on the roof of a building that currently contains an Apple® retail store and separate office space for a web design/digital marketing firm. One of the owners of that firm is the owner of this residence. This part of town is vibrant due on its close proximity to the College of Charleston and prime King Street shopping, so it’s a unique modern addition in what is otherwise a tightly controlled historic district. We’re excited to see how this concept may impact downtown Charleston new construction in the coming years. 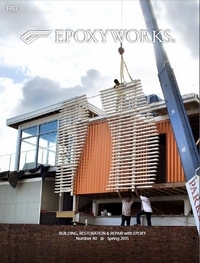 This entry was posted in Architecture and tagged Architecture, cover story, Emily Soyka, Epoxyworks #40, Kevin Hoertdoerder, Renew Urban, Six10, Spring 2015 on August 27, 2015 by ewadmin.